As Classic Role-playing Games go, Tower of Time is not going to be winning any prizes for substantially changing the formula too much. There are CRPGs that offer a more involved and wondrously crafted story, those that span across a wide range of locales and offer character progression and development through a set of unfolding events; however, that’s not a criticism as such. The fact that it doesn’t break away from the formulae of its predecessors and the games from which it draws inspiration doesn’t mean that it doesn’t innovate, or indeed that it doesn’t deliver a wonderful experience in and of itself. It absolutely does. The game starts with you as a child stumbling upon a ruined, inverted tower that is planted into the earth, cracking the land around it like a gigantic tent peg hammered into the ground. 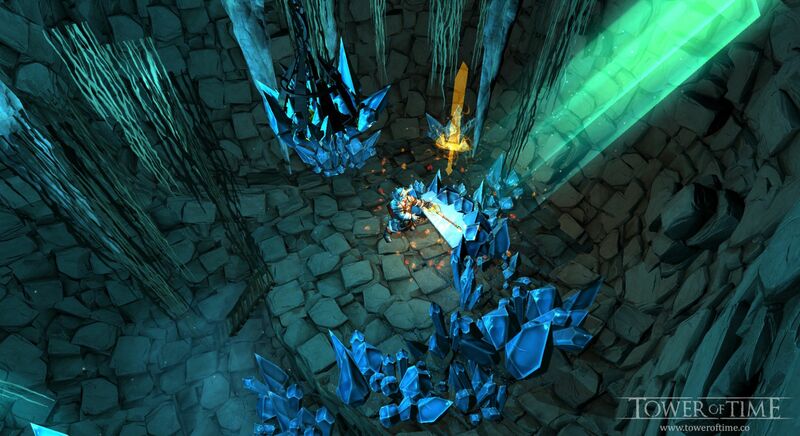 A quick bout of exploration finds you before a crystal throne emanating with power. Whatever power resides here speaks to your younger self, telling you that you are one of promise and power, but are currently not ready to harness the potential of the throne and the tower. Ominous, but it plagues your character’s mind until he grows to adulthood and returns to this place – this time with a retinue of his most trusted agents, Kane and Maeve. As you take the throne, your character becomes a passive force that guides. You assume the role of Overlord, watching his faithful warriors explore the depths of the tower in your stead. I found this to be an interesting narrative piece as it draws away the heroism from the protagonist and instead gives an in-universe explanation of how and why you’re controlling the characters in the game as they explore and unearth the secrets of the tower. 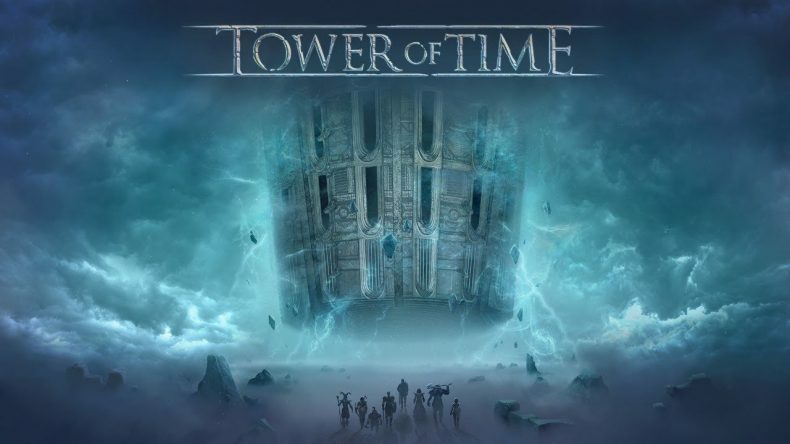 As I stated in the opening paragraph, Tower of Time doesn’t break the formulaic narrative of CRPGs, delivering most of its exposition through heavily laden text that was a little overwhelming at first, even for a seasoned adventurer with a penchant for smashing through games in this genre in short order. While there most certainly is a lot of text being laid on you, it’s hand-crafted to near perfection so as not to burden you with useless information. All of it is world-building or leads you to clues to make it through the obstacles before you. The balanced amount and quality of the narrative kept pulling me further into the tower and made me want to explore the depths further. What Tower of Time does, it does very, very well. Combat is, arguably, the biggest breakaway from the traditional CRPG format as it combines real-time control of your characters – which is then supplemented with all-important Slow Time mechanic – with the character skills and spells of a traditional RPG or even MOBA. You have a roster of seven characters total through the game with a total of four that you can take into combat at any one time. Starting the game, you’ve only have the two characters to control and worry about; Kane and Maeve. This lets you experience the combat in a lighter way, breaking you in with only a handful of abilities that needs to be learned. After a quick saunter through the Tower, an elven Druid named Aeric joins you and ramps up the combat difficulty a little more. He’s powerful but has the defences of wet paper, thus forcing you to be a little smarter with your character positioning and abilities. I learned quickly that positioning and clever use of game mechanics – namely the traps, Kane’s rock wall spell, and breaking line of sight – allows you to manage how the enemies approach your characters, creating neat funnels and choke points. It also allows your characters to break channelled spells cast on them, force ranged enemies closer to your melee characters, and breaks up when they reach the combatants. Fairly basic mechanics, really, but something that a lot of RPGs have conditioned us to forget nowadays. We’re usually so strong or have arsenals of spells and abilities that these simple strategies of leading your enemies on a merry chase becomes negligible or redundant. It’s more akin to a RTS in that you can kite enemies around while your ranged characters pummel them with shots. With Tower of Time, these will need to be employed as much as your spells and the Slow Time feature to succeed; especially on the harder difficulty settings. Combat in this game was at times brutally hard, but it never felt unfair. Losses were either a case of being overwhelmed through carelessness, not utilising Slow Time enough, or just plain negligence. It compelled me to jump straight back into the fight and try again, employing a different tactic and being a little more attentive to enemy spawn locations and their position in relation to my heroes. Positioning is key! Regardless of combat, there’s something to be said about paying attention to the text you’re being shown, too. As I mentioned earlier, the game offers up a heavy load of text but there are clues hidden within them that allow you to make the right decisions and helps you to progress. I’m ashamed to admit that, through distraction, I skipped over something early on and missed the cue as to what I needed to find next. It took a solid 15 minutes to realise that I needed to backtrack a short way to activate something to advance the story. Further shame was that it took a little longer to explore the City menu and check the Library – which offers information like a quest log and stores notes or journals found along the way. I never had to learn that lesson again. Exploration is hugely important if you want to succeed. Tucked away in tiny nooks and behind hidden doors are items, scrolls to enchant your gear, and blueprints to upgrade your buildings. I found that these discoveries allowed me to give enough power and edge to my characters that the combat went from brutal to manageable; still pretty brutal, though. Character levels and city management is an interesting aspect of the game that also shouldn’t be ignored, or the tutorials glossed over. 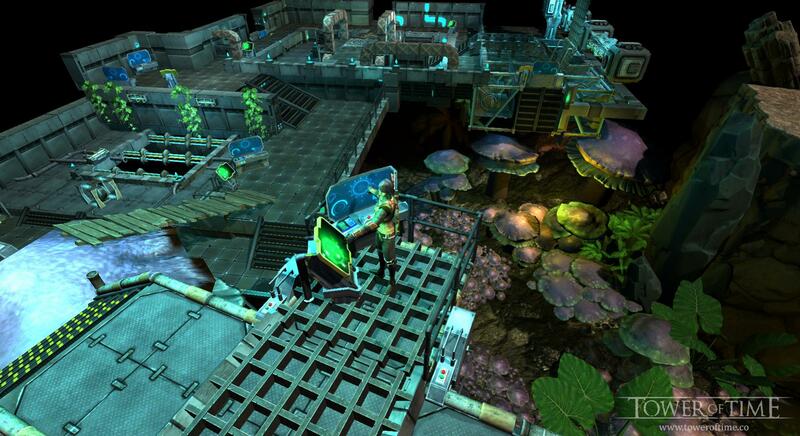 Firstly, the city above ground near the tower is where you’ll conduct most of your character and item management. There are several buildings from a Blacksmith, Barracks, Keep, Library, Artificer Hall, Armory, Mage Tower, and of course the titular Tower itself. These buildings aside from The Tower and Library are where you manage your party, craft and enchant equipment, and train your heroes. The Mage Tower, Artificer Hall, and Armory are directly related to certain characters. The level of each of these buildings determines the maximum level of the characters that are related to it. So simply put, upgrading the Armory increases the maximum level you can train Kane, Maeve, and Baron. The Artificer Hall controls Rakhem and Kaela, while the Mage Tower controls Aeric and Whisper’s maximum levels. These upgrades cost gold and a blueprint to complete, and character training also costs gold, so currency is vital for your party’s progression. Training progresses your heroes’ levels, and with each milestone more of their Skill Tree is opened up to you. At specific milestone levels you’ll also unlock completely new spells. The skill tree adds surprising depth to customisation and will require some study. I found that switching these specialisations and point assignation could sometimes make fights nigh impossible. Variety is the spice of life, and there are some great combinations you can utilise with these skill trees. It’s wise to also balance your building upgrades as you go so as not to leave a set of characters lagging. Thankfully, the first two characters that join you after Kane and Maeve occupy the Artificer Hall and Mage Tower, so from a very early stage in the game you’ll need to balance each building’s progression. I felt that the City and character management was an interesting mechanic of the game itself and forced me to try new setups with each character for various stations, switching out the high damage output for increased radius can sometimes be the difference between victory and crushing defeat. In conclusion, the game might seem to be a little formulaic to veterans of CRPGs, especially in the storytelling department, but it is not without innovations of its own. For developer Event Horizon, Tower of Time is an astounding first title that gives fans of the CRPG genre something different to sink their teeth into. The game is compelling, immersive, and fantastically balanced to offer a challenge without burying you in complicated mechanics or frustrating odds. Criminally under-marketed, but wholly worth your time.